I knew it’s going to be a memorable adventure at the moment I’d found a 20 Rand bill at the parking lot. 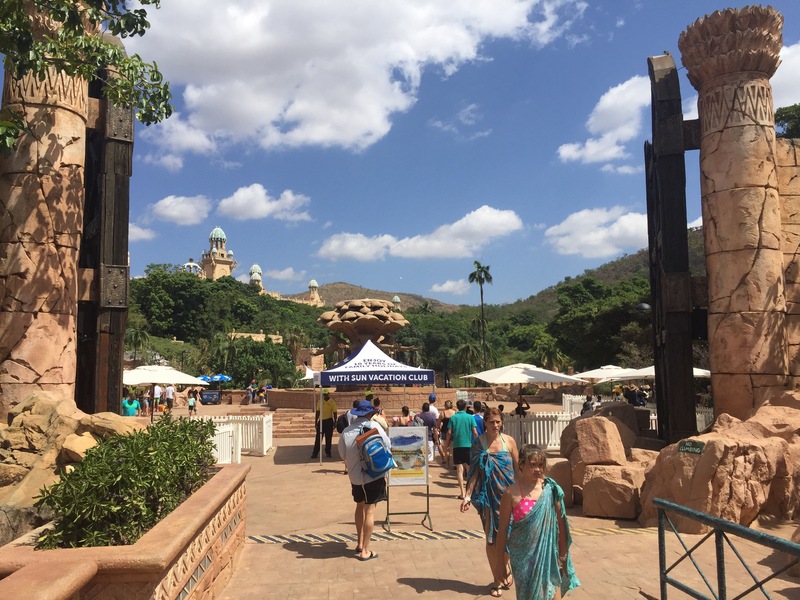 Generally, I was pretty excited of visiting Sun City, the exotic well hidden Paradise of South Africa. I was unable to see and hear anything. But stepping out of the car, right in front of me was laying that bill, like a clear sign of a challenge. The start was promising, as I had no idea yet what to expect from my later becoming magnificent Christmas trip to Sun City. 20 South African Rand bill is about 1 British pound, (GBP), so you can think right now it was nothing. But I am kind of superstitious (when it suits me), so this unexpected gift was a signal of a smooth beginning and a fine end of the Christmas day. Speaking of Christmas when the South Africans welcome the summer is a bit tricky. Remember, the summertime in this part of the world is from December to February. When Europe and the USA are suffering under the heavy snow, here the locals are sunbathing, which sounds to me as an unusual, but great Christmas experience. 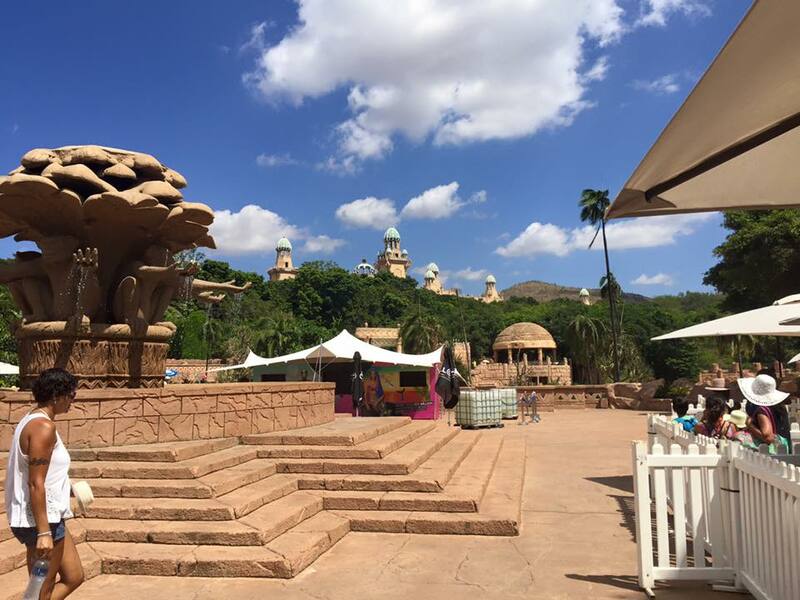 In addition, having Christmas in Sun City is like a dream come true. It’s December 26th. Out of any tradition, no snow, plenty of sun, fresh greenery, flip flops instead of boots, variety of exotic surroundings. Built in the middle of nowhere, Sun City is supposed to be a dry bush area like everything in this South African region. But it’s not. This place could be compared with nothing else existing. 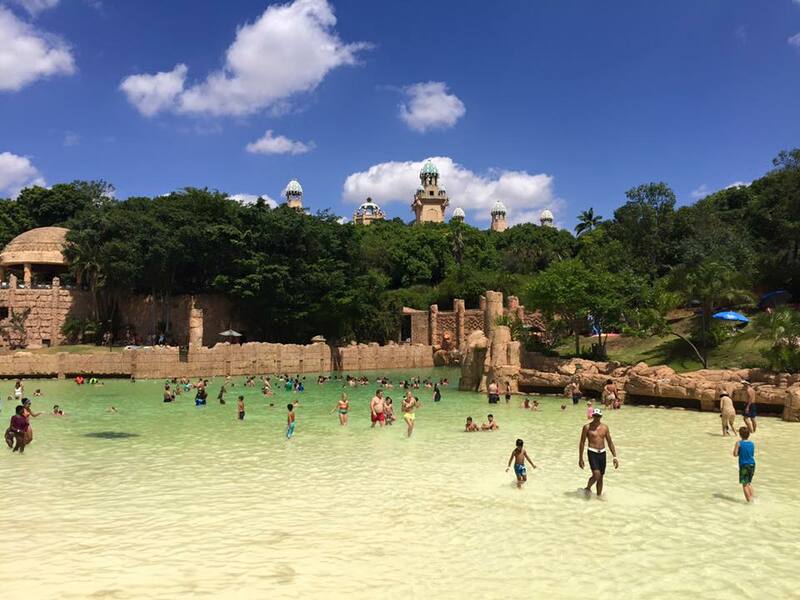 About two and a half hour drive from Johannesburg, Sun City is an artificial oasis, made to please, inspire and excite its visitors. There are no permanent citizens in that city, but all the visitors are incline to come over and over again. 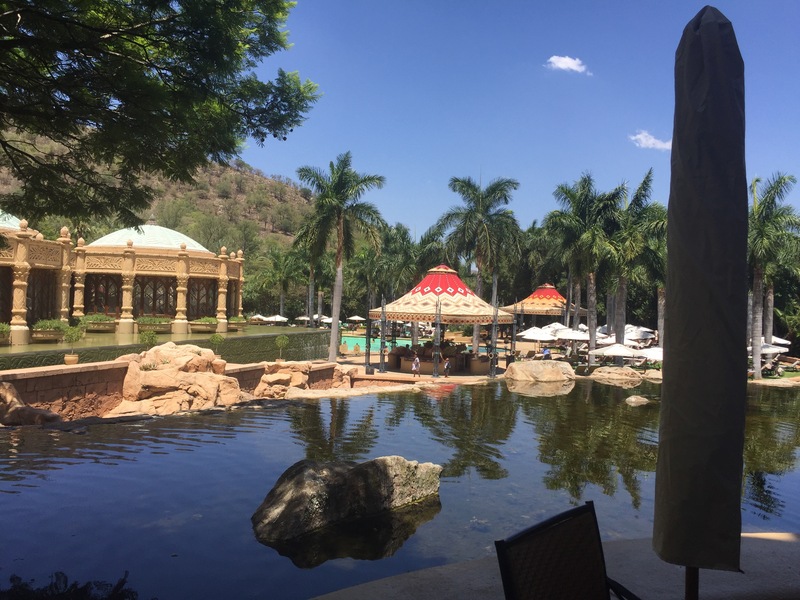 If there is a Paradise on Earth, it must look like Sun City itself. Just imagine lots of greenery, thickly grown jungle in the middle of the bush. Also plenty of water sources – waterfalls, large pools, cascades, fountains, lakes, lazy rivers, valley of the waves, water slides, hidden springs, large turquoise beaches … In between – ancient castles, amphitheaters, unexplored caves, secret bridges and stairs, tower tops over the jungle, magnificent fairy buildings, palaces and of course…casino. I have no idea where to start from. Maybe from the weather. 30 degrees Celsius, no wind, beautiful skies above with full figured clouds. Doesn’t look like Christmas at all and this is the beauty of the moment. When I look around, with all those people in shorts and T-shirts, sitting next to crocodile statues and walking through the “ancient” remains, I feel like in an abandoned kingdom. With every step I had the feeling of being Alice in Wonderland, completely stunned and astonished, facing hundred of non-existing out of this world miracles. Not sure what kind of human mind could create all of those structures and facilities, but it managed to make me feel small, insignificant, lost and a bit scared. All around is pompous, shiny and gigantic. My first impression – I was exploring a legendary lost civilisation, remained from aliens. When the bus picked me up from the parking lot and drove me to the enormously high gates, I had no idea what to expect behind the gates. I checked some pictures and read some info in advance. But all I saw later, took me much beyond the expectations. 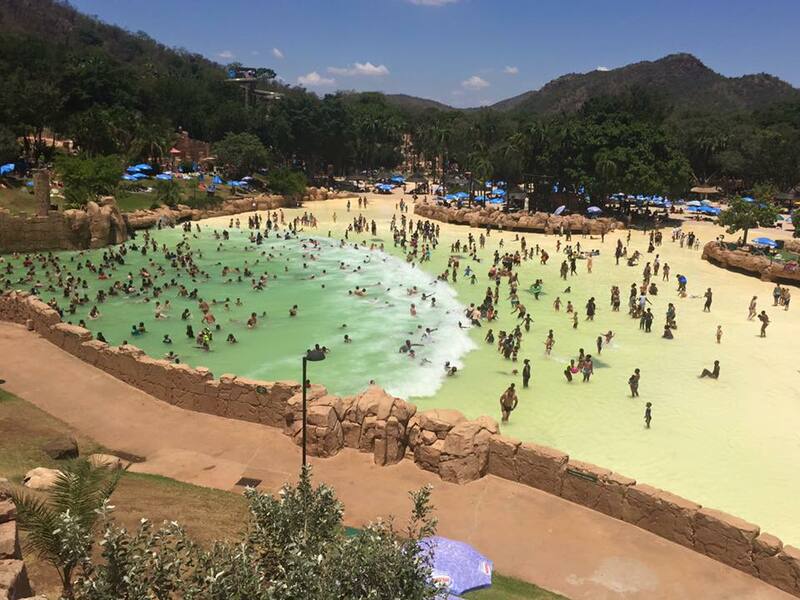 The regular information about Sun City describes it as a popular spot for glamorous events – Miss World contest, World Boxing Association title fights, Award giving events, famous golf tournaments, rock and pop bands’ concerts ….sounds too shiny and expensive to the ordinary visitor. But nowadays it’s kind of affordable. 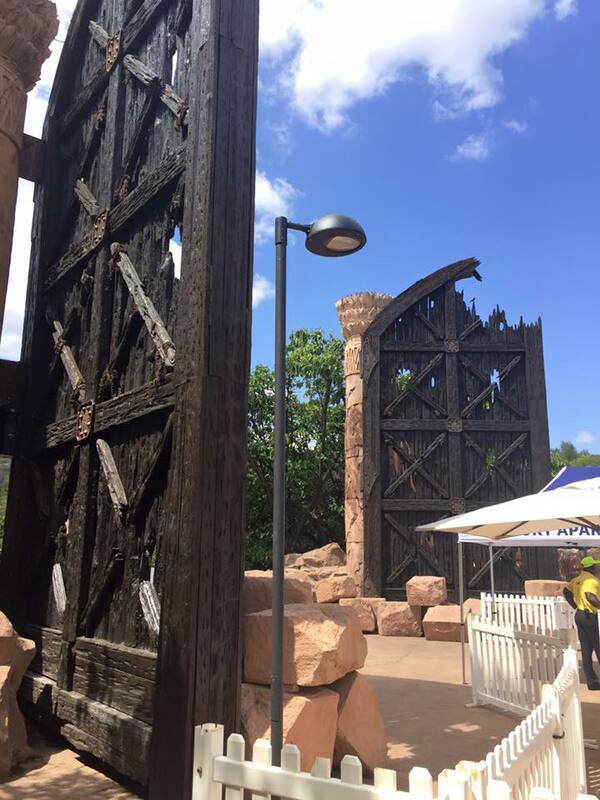 All you need is a day visitor pass, which costs 160 Rands (about 9 GBP) per adult. It provides access to Valley of the Waves, the main attraction, with all the water slides, lazy river, bars, restaurants and etc. That famous pool with artificial waves is just a small spot on Sun City map, but gives you an impression of the environment. 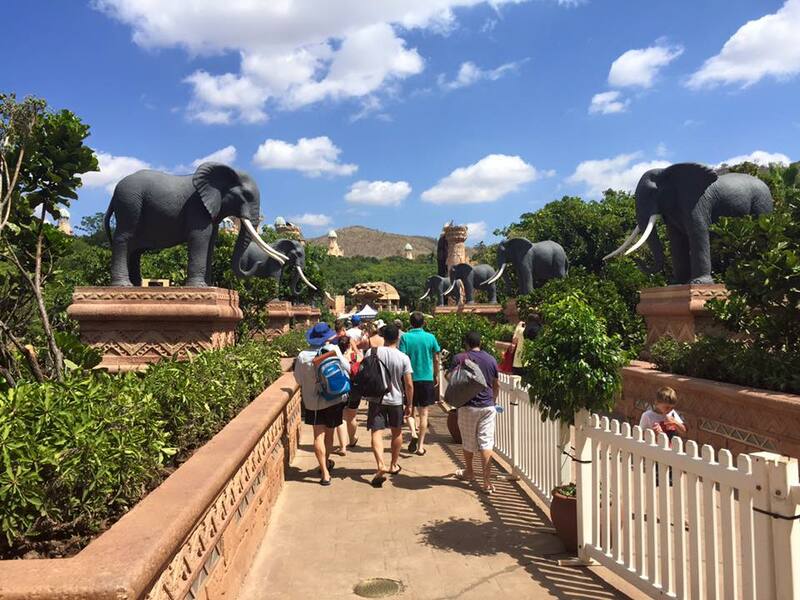 The statues of South Africa’s wildlife surround your path to the heart of the City. It looks like they will come to life in a while and it made me a bit nervous, moving in between. 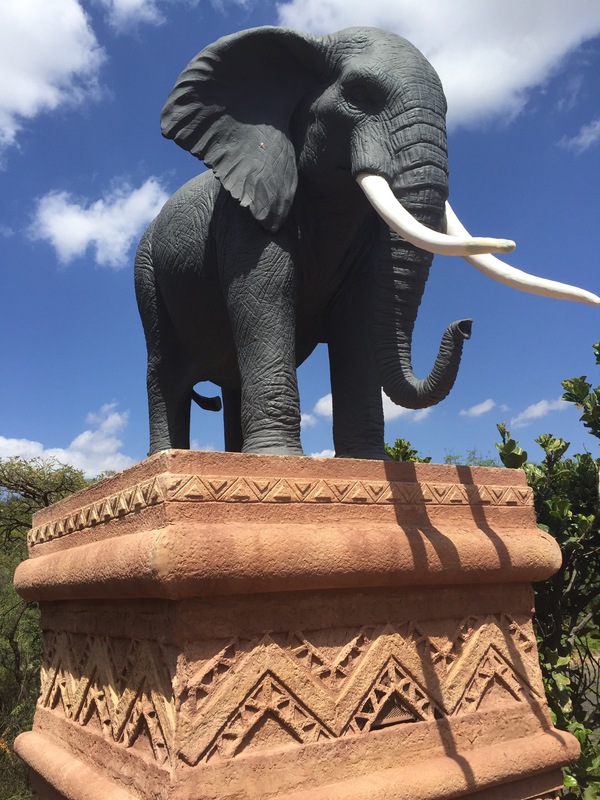 Monkeys, elephants, cheetahs, lions, giraffes in extra size accompany all your moves, like you have the privilege to step into their sacred world. It’s a real temptation, because in the casino you feel like everything is achievable, even to become a millionaire by blink. Built to make you enjoy the process, while losing your money, the casino forces you to bet excitingly and urge towards the big prize. I felt a bit like in “Percy Jackson&The Olympians” movie, where Percy’s group was trapped in a Las Vegas casino, eating non- stop Lotus cookies, making their brains sleepy and dizzy, losing any idea about the reality and time.Thank God, I managed to keep my mind cautious and got out of the casino’s euphoria soon, heading to another attraction. No doubt, the main one is the large pool with the waves, called Valley of the Waves. Hard to explain or describe it. It’s colossal. The turquoise water looks warm, clear and calm. Then a ding sound comes from the enormous lions’ heads on the wall. The waterfalls start running from lions’ mouths. The exalted crowd inside the pool starts screaming, anticipating the upcoming “apocalypse”. Suddenly a high wave pops up near the Lions’ wall and gets taller, rising toward the screaming swimmers. Then comes the second and the third wave. Most of the swimmers are immediately blown by the waves or already sunk. Sounds funny, but could be dangerous, as it’s easy to lose the bottom under your feet and to get trapped in a whirlpool. On this blessed day, nothing horrifying happened. After the waves were gone, on the bottom could be found plenty of lost sunglasses, hats, flip flops or even swimming suits. Two meter high waves are usually seen as a blessing in a hot day. They also increase the level of adrenaline, make you feel alive and full of energy. It has nothing to do with the Christmas spirit, but somehow helps to keep it at a high level. I believe it’s not a real danger, because the lifeguards were everywhere and you feel fairly safe. But upcoming waves are kind of a challenge, daring you to overcome it. So, it’s a great experience, fighting the waves or just going with the flow. You probably can’t fully picture it from my photos, I mean the real strength and power of the waves. Looks mostly like fun on a shallow spot. But the truth is the wave would easily knock you down, turn you upside down and spit you dizzy at the end. No one thinks about the process and all the participants in that crazy show enjoy the upcoming water walls and jump with them. When the waves were gone, the depth of the pool is negligible. Anyway, if someone is scared to jump with the waves, they could stay at the surface of the pool, where the water hardly covers the ankle. It’s worth it to be in here and to experience it. Even if you are around just to watch how others fight the waves, it’s still fun. With all the bars and restaurants carrying exotic names, it’s pretty easy to enjoy the events, while dining at the terrace with breathtaking view to the valley. Lots of happy partying people around from different nationalities, religions, skin colour, traditions. What unifies all of them is the sense of freedom and happiness. They all are smiling widely and laughing. I could spend a whole day just around that wavy swimming pool, but so many attractions nearby to join. 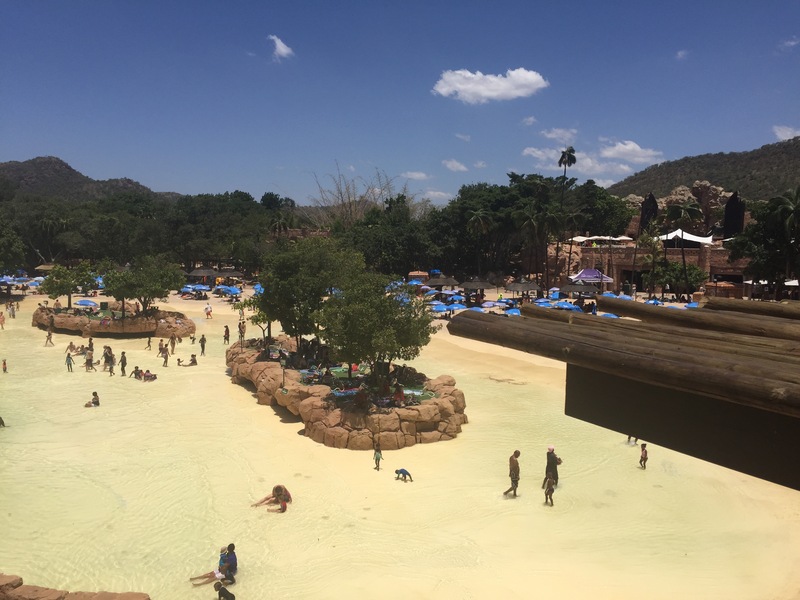 The water slides offer from open facilities for the kids to dark hooked tunnels for the boldest, where the water flow shakes you and lifts you all the sides. 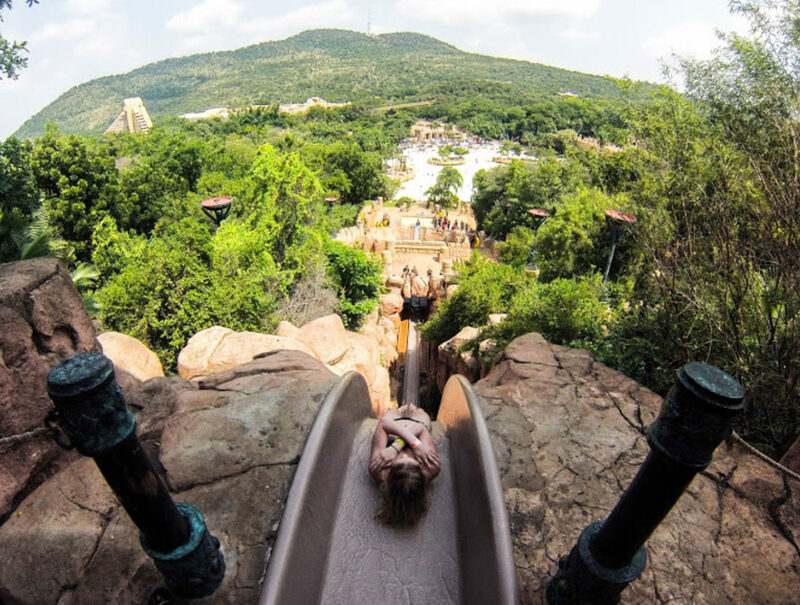 The water slides are the noisiest attraction, as no one is able to keep calm, riding the tunnels. I am not a big fan of roller coasters and such extreme attractions, but it was impossible to visit the aqua park and not to test all the challenges. I would avoid the fact, I was doing it as the only adult among a group of children, not older than 10, who repeatedly slid many times. I guess the courage drops to lower levels with the age 🙂 But I was the first to jump in the Sacred river. It’s such a relief after the extreme water slides. 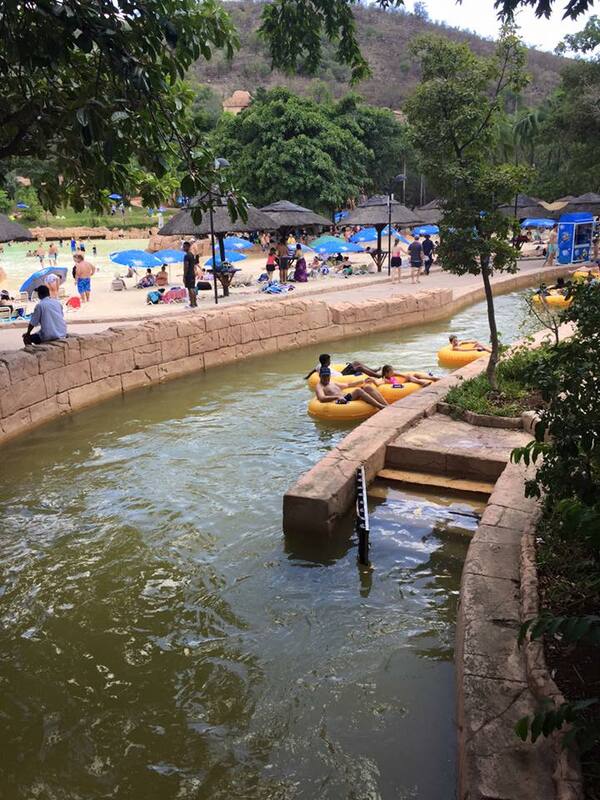 You just choose a tube, jump in it and the lazy river flow takes care of you. The last day of Christmas looks promising – warm, lazy and joyful. The tubes hit each other, turn back and front, go under bridges and through bubble explosions. The good news is this journey is endless and you can race as many laps as you want. Till your skin is completely burnt 🙂 But you can always jump into the water, swim a bit and then go back on the tube again. When you get tired of the sun, grab an ice cream cone (plenty around) and start exploring the jungle. Lots to be seen in there. Follow the towers, visible over the trees, to discover the Lost City Palace, that is marvellous. Or just wander with no direction and occur at the “ancient” replica of amphitheater, finding a cave or a crocodile amulet. Then meeting real monkeys, nearby The Lost City palace. At the end of this miraculous Christmas day, nothing left to be added. I experienced a very different Christmas, but can’t say the Christmas spirit was missing. It was just quite surprising, thousands of miles away literally and metaphorically, from the European Christmas traditions I am used to. 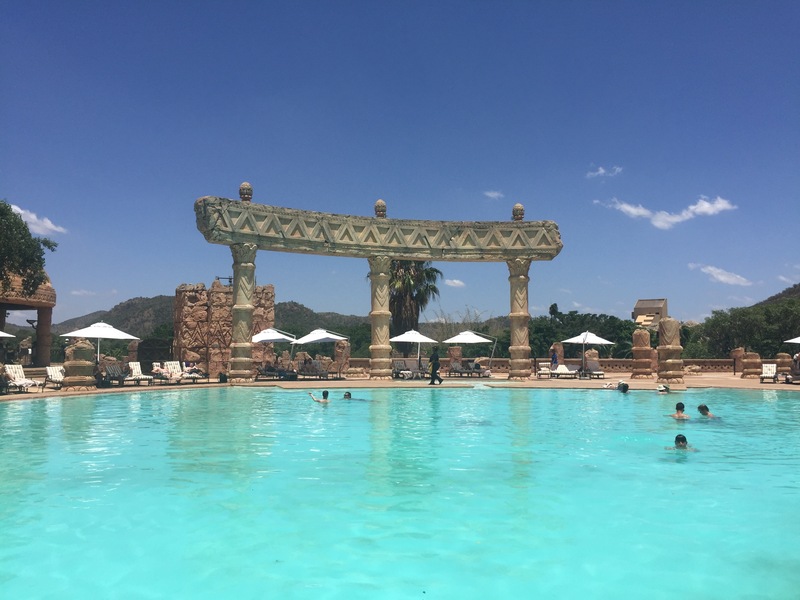 This magnificent Christmas trip to Sun City, South Africa remains simply unforgettable and I don’t mind to go back again, but next visit out of Christmas time.